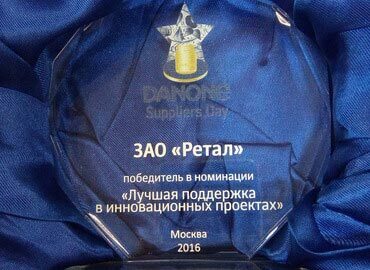 RETAL has been recognized as "The best innovative partner for DANONE"
RETAL has won "The best support for innovative projects nomination" at a DANONE Supplier Day, held at Moscow School of Management Skolkovo on October, 26. With this event, a world leading corporation in dairy products has decided to encourage the achievements and wins of its partners in promising regional markets of the CIS countries. Over 40 DANONE-partner companies competed for 16 nominated awards. It is particularly important for DANONE, as an investor in research and modernization of healthy food production, to implement innovative and up-to-date methods in business processes. RETAL’s triumph became a result of the management decisive actions, with the line reconstruction investments over €2 million, as well as with a high level of a teamwork in all phases of the project - from planning and training new technologies to the company staff, to the successful products marketing. RETAL project objectives included a full cycle: from a design concept and a selection of the most effective technology for this type of packaging, to production tests and industrial batches, and to the financing of the project, and full service and technical support of the partner. Experts collaboration led companies to a double success: to the victory in a prestigious contest and, of course, to the main accomplishment – a market entering with an innovative and commercially successful product. We congratulate our colleagues with a well-deserved award and thank our partner, DANONE company, for the cooperation and appreciation of our company!